Before we get started today.....I want to share a little secret with you. My child's finger, pointing, touching, or tasting. - Preheat the oven to 400F degrees with the rack in the top 1/3. Line one baking sheet with parchment paper. - Whisk together the agave nectar, almond extract and milk in a small cup, and set aside. 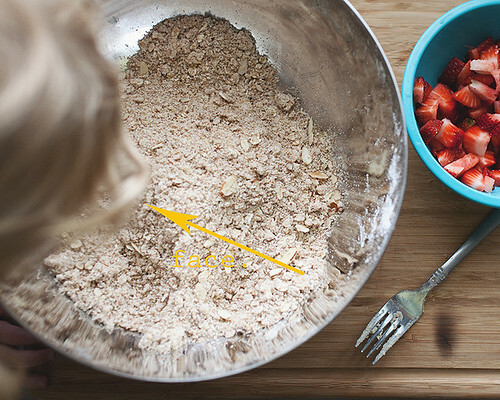 - Combine the flour, oats, almonds, flax, wheat germ, baking powder, and salt together in a bowl. - Using a food processor, cut the butter into the flour mixture, pulsing until it appears sandy (about 20 quick pulses). ( I just used a fork) Continue mixing until you have a good sandy texture. - Add the agave/milk mixture. Mix until the dough comes together. Be careful to avoid overmixing. You can add a little more milk if the dough is too dry. 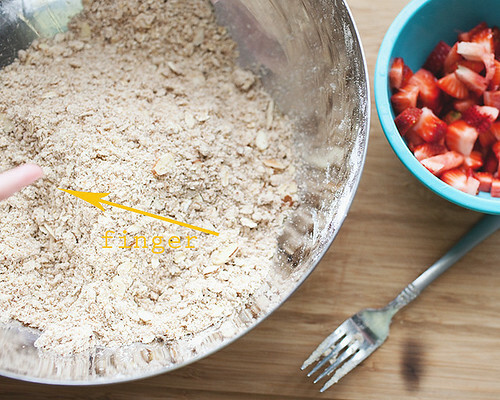 - Gently fold in the strawberries with your hands. The dough will be very crumbly, this is ok! - Turn the dough out onto a floured surface or a piece of parchment paper, kneed once or twice, if necessary to bring the dough together. Press in any strawberries that may have fallen out. Be gentle with the dough and avoid over working it. - Press the dough into a 1-inch thick rectangle or circle. (I did two circles, for smaller scones) Cut into even sized pieces. Place the pieces on the prepared baking sheet with at least 1/2 inch between each scone. Brush the tops with the beaten egg and sprinkle with oats. -Bake at 350° for 20-25 min. top with a bit of honey and enjoy! Thank you SO much for this recipe! I can't eat a lot of sugar and have been trying to follow a whole wheat diet. This looks like one of the best recipes I have found yet! what? you make things like this but you ask for help about pizza? you can make pizza i promise. ps "bloopers" is a funny word. and your bloopers are actually very nice. I'm totally going to try this! mmmm. this might just have to be my 2nd batch of scones this week. (just made orange ones yesterday.) something strawberry sounds perfect right now. these look amazing! thank you for sharing the recipe. can't wait to try them. oh, those look so tasty. i must try them. These look and sound really, really good. Thanks so much for sharing the recipe! I just stumbled upon your blog and am smitten. It's lovely. I'm glad I found you. Happy Friday to you! I just found your site the other day and I'm so glad I did! It's lovely. 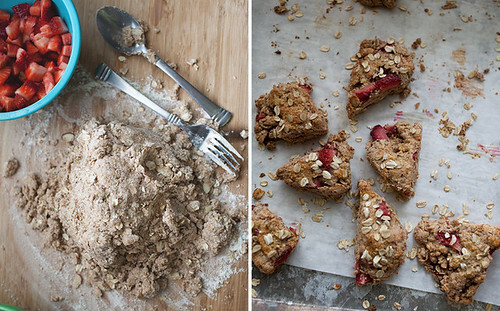 And these scones look heavenly. I just made them and I'm waiting for them to cool. 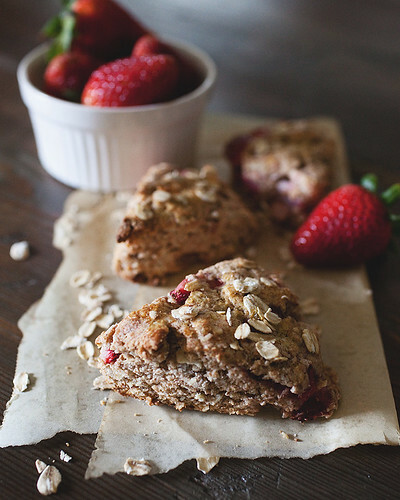 I've actually never had a scone before, but anything that has strawberries baked into it must be good :) Thanks for the recipe!